On August 29th I wrote a posting about the StackPanel (https://arcanecode.wordpress.com/2007/08/29/stacking-the-deck-with-the-wpf-stackpanel/). A commentor asked “how do you add controls programmatically?” Good question, and it turns out to be quite easy. A few things I’d like to point out. I’ve given a name to the StackPanel, so it can be manipulated in our C# code. I also added a handler for the Click event for the button, btnAddMore_Click. I also named the button, although it really wasn’t necessary for this sample. 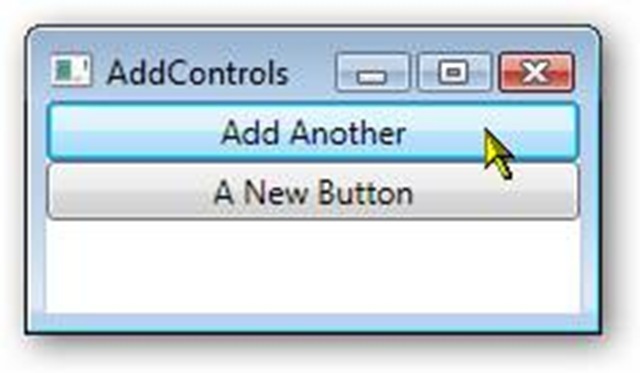 Note in this example I used the fully qualified System.Windows.Controls, I did that just to be explicit where the Button came from. After a new button is created, I set it’s Content property, which in this case will be the text on the button. Now we have a new problem. We’ve added a button to the StackPanel, but clicking on it does no good as we haven’t tied it to an event handler. Turns out that’s pretty easy too. The signature for the event handler has to match the signature for a Click event, since that’s what we’re routing to. Here, all I do is display a message box just so you can see something got done. Run it again and press the Add Another button, and the “A New Button” should appear. Press the new button and you should see a message box. I could have created the entire form in C# (or VB.Net) code, adding the StackPanel directly to the “this” object. However, that gets a bit laborious, and I wouldn’t recommend it as a general practice. Previous PostWPF Text ControlsNext PostI’m going to DEVLINK!!! 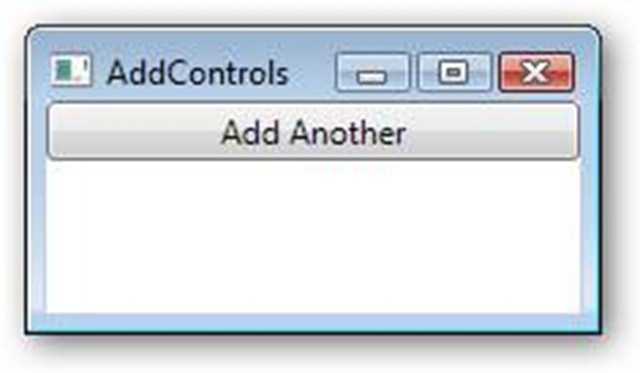 Hi, I just wonder how do add stackpanel control to a window object at run time. I tried to make a DataGrid control programatically, and failed. Anyone seen an example like that? Very Good! simple and clean! 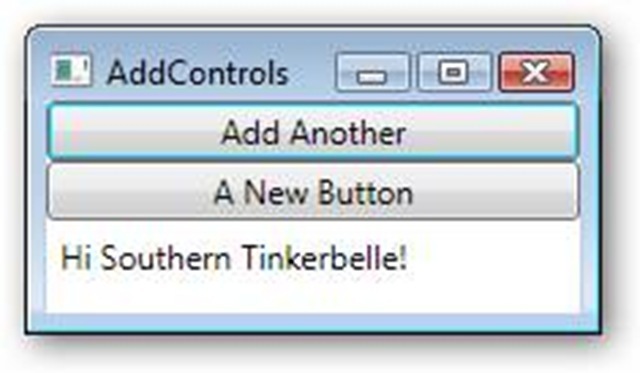 I was able to use your example to implement a app which allows dynamic user control additions to a stackpanel. I would be able to remove a single selected panel, but can’t seem to programmatically find it anywhere. Any thoughts on how to attack this problem? Hey ,… you haven’t done thorugh MVVM patern. Do you have solution for this in MVVM patern? so how would you access the details after, say you wanted to get the text of a dynamically added input box ?